Do you have one or more teeth that are suffering from an injury, decay, or general wear-and-tear? A customized dental crown may be the ideal way to revitalize your smile. 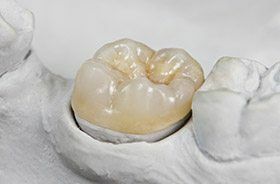 At Torrington Dental Care, we’re proud to offer porcelain dental crowns that blend in beautifully with natural teeth. The results feel and appear exceedingly lifelike. Every crown we provide is custom-made for each patient to ensure the perfect look and fit. Why Choose Torrington Dental Care for Dental Crowns? Dental crowns are tooth-shaped restorations, and they’re a durable way to protect hurting teeth and even correct chronic problems with excessive spacing or awkward positioning. Whether you only need a single dental crown or could benefit from several placed at once, our team is here to help. We also have E4D technology, which simplifies the restorative process down to just a single appointment of your time! To learn more, please contact us in Torrington, CT. We’re happy to see patients from Burlington, New Hartford, Harwinton, Goshen, Bantam, Winstead, Litchfield County, and beyond.